Albequerque, New Mexico — Two homosexual men are suing a Christian school in New Mexico for refusing to accept their three-year-old to preschool. Joseph Romero and John Keelin state that they were originally told by Hope Christian School in Albequerque that the boy could be admitted to class, but received a denial letter after officials discovered that the boy’s parents were both men. When Romero and Keelin inquired further, the school corresponded with the attorney for the two men, reiterating that homosexuality is inconsistent with the beliefs and values of the Christian school, and that being a private institution, it has the right to be free from government interference. Some are also stating that although the school asserted that it is a private religious institution, it should still be required to admit the child because it receives partial federal funding. Romero and Keelin, through their attorney Shane Youtz of Youtz and Valdex, are seeking equitable relief, including that the judge will require that the boy be accepted at the Christian school, as well as compensatory and punitive damages. 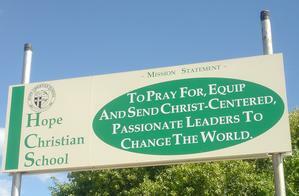 Attorneys for Hope Christian School have not yet commented on the matter. As previously reported, in June of this year, a New Mexico Court of Appeals ruled against a Christian photographer in the state, declaring that the woman must shoot homosexual ceremonies despite her Christian beliefs. Elane Hugenin and her husband Jon, who run Elane Photography in Albuquerque — the same city as Hope Christian School — first came under fire in 2006 when Elane told a lesbian woman that she could not photograph her commitment ceremony. The situation soon ended up before the New Mexico Human Rights Commission, who ruled against Hugenin in 2008, stating that she was guilty of violating the state’s sexual orientation discrimination law. The commission then ordered the photographer to pay nearly $7,000 in fines for refusing to shoot the ceremony. Hugenin then appealed the decision, arguing that forcing her to go against her beliefs regarding homosexuality would be like forcing African Americans to photograph Klu Klux Klan members. The Court of Appeals upheld the guilty verdict, however. Last month, the Kentucky Human Rights Commission likewise ruled against the t-shirt company Hands On Originals after it refused to screen t-shirts for a homosexual pride parade put on by the Gay and Lesbian Services Organization (GLSO). However, the Commission said that the business could not refuse homosexuals regardless, and ordered Adamson to pay an unspecified amount in damages. “The investigation reveals that although respondent states that they have not denied business to one customer based on their sexual orientation, [it] does not eliminate the fact that they denied GLSO business based on their sexual orientation,” it wrote in its Charge of Discrimination. Dear Reader, has ChristianNews.net been of benefit and a blessing to you? For many years now, the Lord has seen fit to use this small news outlet as a strong influential resource in keeping Christians informed on current events from a Biblical worldview. With much compromise and many falsehoods in modern-day Christianity, we strive to bring you the news by keeping Christ and His word in focus. If you have benefited from our news coverage, would you please prayerfully consider becoming a Christian News supporter by clicking here to make a one-time or monthly donation to help keep the truth of God's word widely and freely published and distributed? May Christ continue to be exalted through this work! Get Breaking Christian News in Your Inbox!